Some more information for you with notices of future events – in particular on Tuesday next week whether your interests are in Constantinople or in Cumbria. 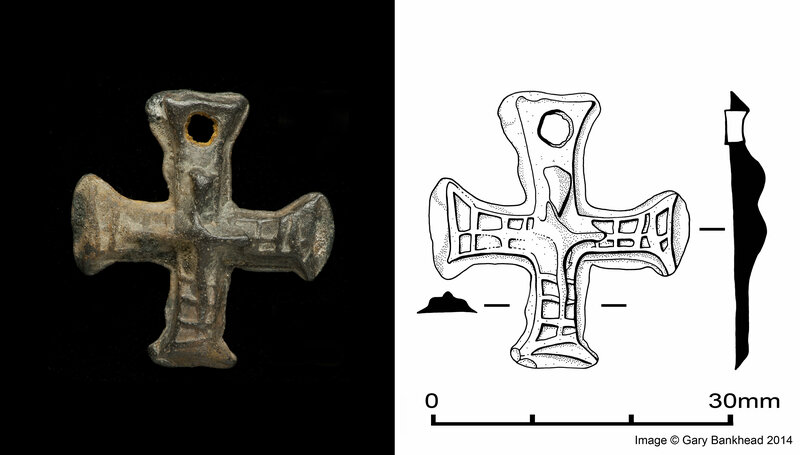 We aim to provide as much archaeological information as we can to you. 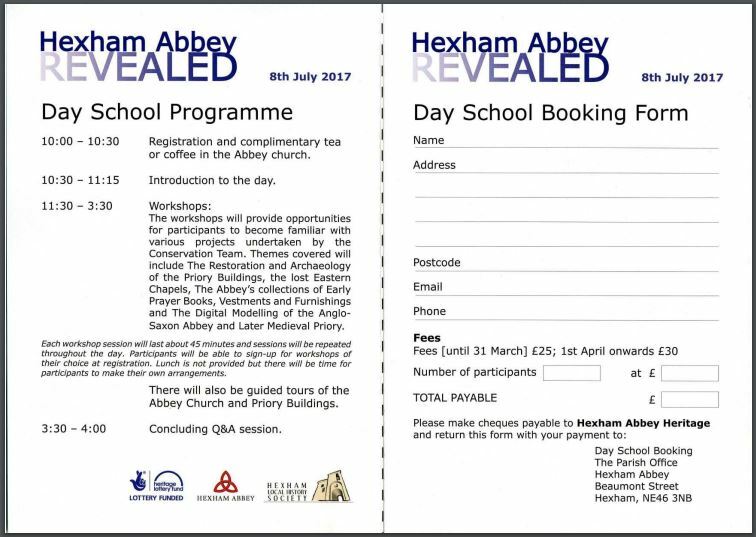 If you are seeing this and not a CBA North member why not join us or let us know of any archaeological events you are running? More news and information next week – enjoy the Heritage Open Days weekend in the meantime. Mike Nevell and Rachael Reader send us notice of a series of events in connection with the North West Regional Research Framework – CBA North Committee are involved in this project, as well as parallel North East one, on your behalf. Contributions from members and local groups in Cumbria, or other north western interests, are particularly welcomed. CBA North Committee have reviewed our progress to the original North West Archaeological Research Framework which our sister organisation CBA North West produced; feel free to let us know your thoughts on how we are doing well against the targets set of us. There is still time for you to book your free space on the Early Medieval and Later Medieval period review workshop, for the North West Regional Research Framework for the Historic Environment Update Project (NWRRF for short) and become one of the first to influence the knowledge and direction of this significant project. 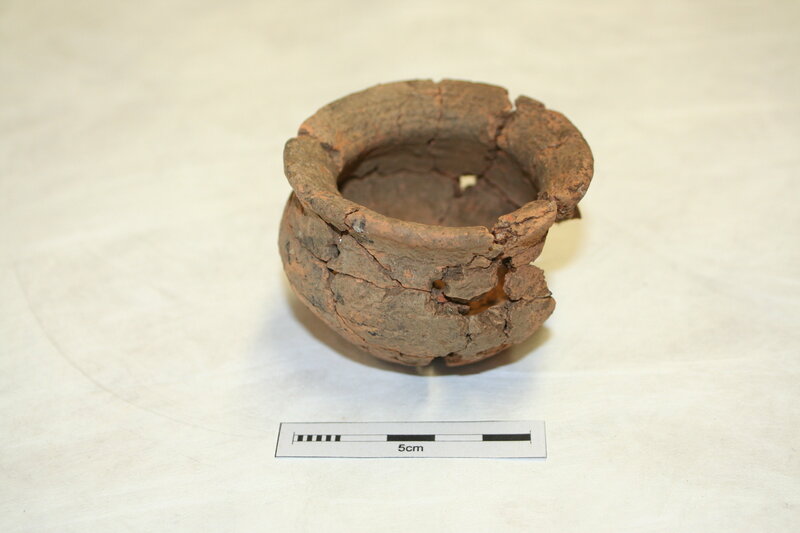 NWRRF is designed to provide an overview of current archaeological knowledge in the North West of England and to identify where the most significant gaps lie and how this may best be addressed. 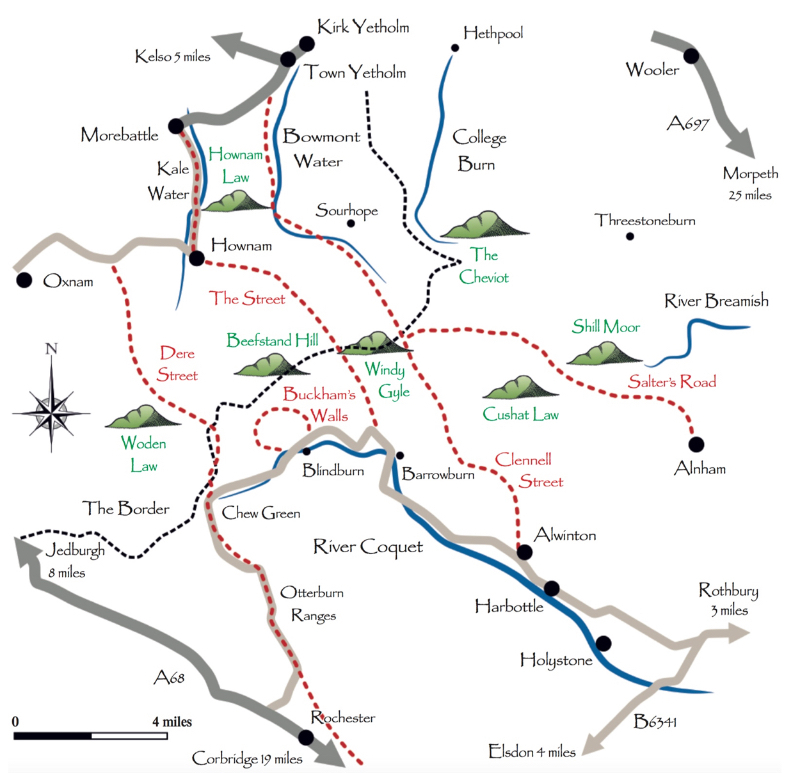 The North West region covers the counties of Cheshire, Cumbria, Greater Manchester, Lancashire and Merseyside, and contains the Lake District National Park. Funded by Historic England, this is a two year project has been designed to update and widen the scope of the original North West Regional Research Framework project which concluded in 2007. This endeavour is being coordinated jointly by the University of Salford’s Centre for Applied Archaeology, ALGAO North West, CBA North West. 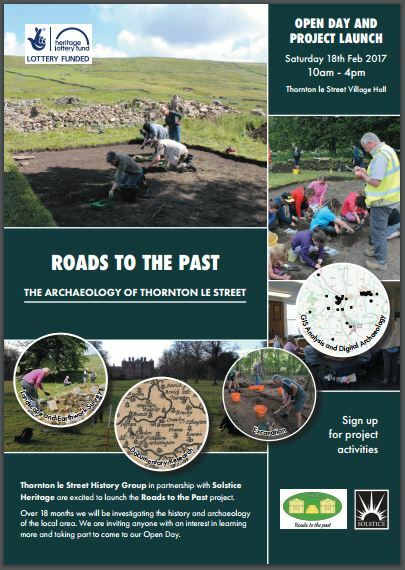 You can keep up to date or get involved with the project either by regularly checking the latest blogs at https://archaeologynorthwest.wordpress.com/about/ or by following @cbanorthwest on twitter or visiting the CBA North West facebook pages or the Centre for Applied Archaeology facebook pages. If you are interested in contributing your knowledge at one or more of these workshops please contact Penny Dargan-Makin (p.r.d.dargan-makin@salford.ac.uk) asap to reserve your place. Once your place has been confirmed I will email you with the period chapter review, the maps, bibliographies, and the research objectives to become familiar with in preparation for the workshop. The Newcomen Society is a national society interested in the history of engineering and technology. Unsurprisingly there is a regional branch in the north east with particular interests in our region. 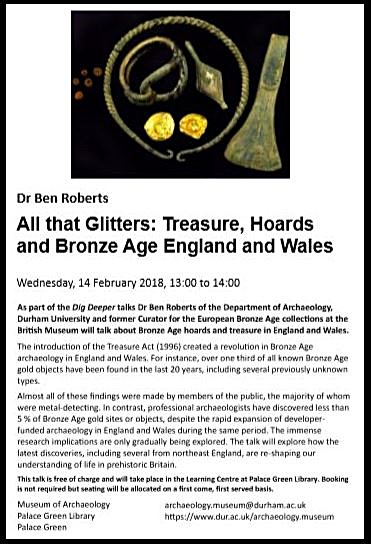 They hold a regular series of talks – some of which are occasionally more archaeological, with this first one they open their series this season. Details of the regional branch’s more archaeological talks will be added to our Events page on the website soon, though we already have a poster for their November talk which we’ll seen out nearer the time. 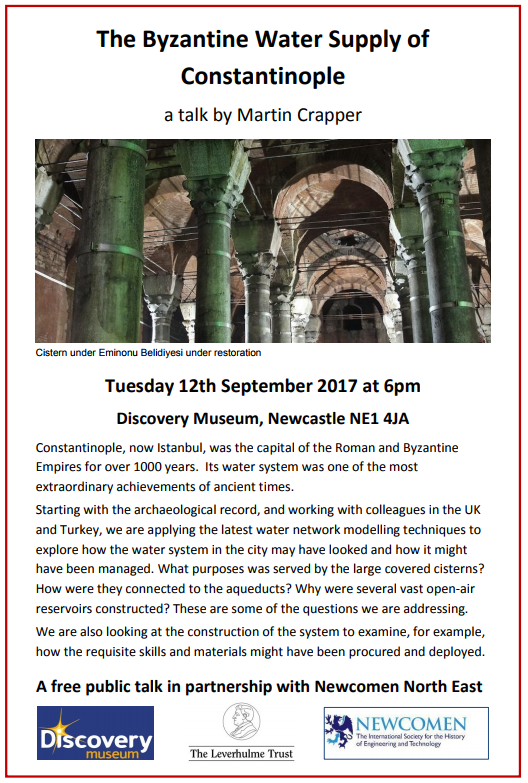 This entry was posted in E Newsletter and tagged Archaeology, CBA North, cumberland, Cumbria, Engineering, Hadrian's Wall, History, lecture, Local History, technology, Westmorland on September 8, 2017 by cbanorth. Another month comes, as does another CBA North email. This time round we have another range from across the CBA North region of what is happening and has happened. 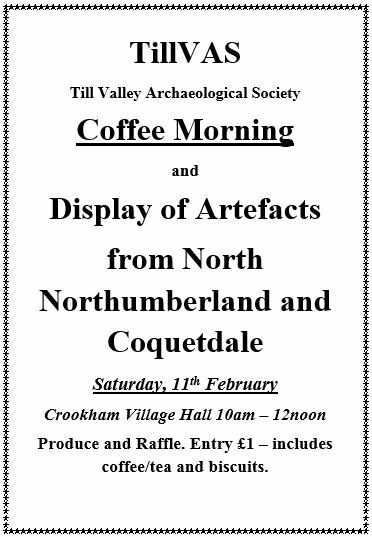 We take our prompts today from our own initials with announcements for a coffee morning (complete with archaeological display) and a report on the Coniston Copper project for the ‘C’s, an announcement for an Alpine axeheads lecture as well as a note from the Arbeia Society for the ‘A’s. Where the ‘B’ you might well ask? That is the behind the scenes ‘busy’ that Committee are in preparing such emails, as well as our own events in April and May, for you. We hope that you will also be busy in attending these events of your own and other local groups. Hopefully the next CBA North email will be out to you by this time next week with some further news. [The weekend coming up has two events; this is the first of the two posters for you – Ed]. 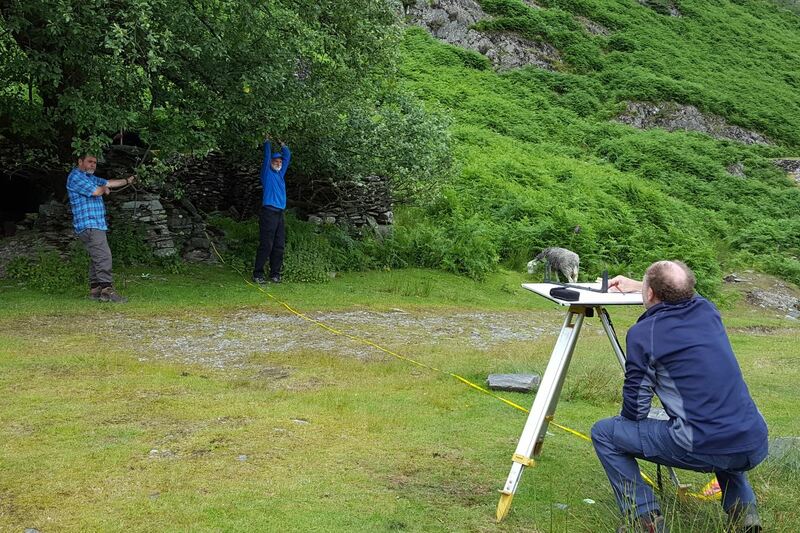 “In August 2016 local volunteers from the Lake District National Park, working together with specialists from Northern Archaeological Associates (NAA), undertook a survey of the remains of Penny Rigg copper mill, near Coniston (NGR NY 30656 00695). 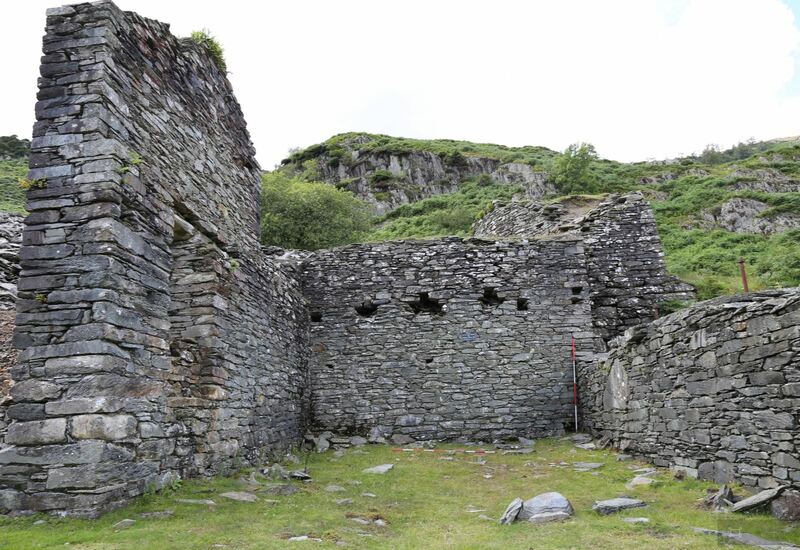 The mill is prime example of a single-phase, medium-sized, ore dressing and processing plant, associated with Tilberthwaite copper mine. The project was funded by the HLF as part of the Coniston Copper Project; a two-year programme administered by the Lake District National Park Authority (LDNPA), which aims to engage the local people in the history and conservation of the areas’ nationally important mining heritage. Tilberthwaite copper mine was first worked under the auspices of the Mines Royal, during the in the Elizabethan period but mined only sporadically after this until taken over by John Barratt, former manager at the nearby Coniston copper mine, in the mid-19th century. Barratt drove a new adit – Horse Crag Level – 1,039 yard (950m) from Penny Rigg to Tilberthwaite to intersect the valuable North Vein. This was intended to improve both transportation and drainage to the mine, and was anticipated to take seven years at a cost of £3,000. However, from the outset the venture was beset with problems, eventually taking 10 years to complete at an undisclosed cost considerably which was significantly over the original initial estimate. Ore from the mine was loaded onto wagons and brought through Horse Level to Penny Rigg, where Barratt and his partners invested in the construction of a new copper mill. Here the ore was sorted, crushed and processed before being sent for smelting. Work on the mill is believed to have begun in 1864 and completed by 1867-68 but it did not remain in operation long, closing soon after the sale of the mine in 1875. The mill later re-opened briefly in the early 1890s, but closed again in 1892, after which the plant was dismantled and the wheel sold for scrap. Today, the 1.5ha site comprises the semi-ruinous remains a number of buildings – the crusher house and dressing mill, smithy and powder house – as well as various terraces, two settling ponds, leats, holding pond, spoil tips and tracks, all of which are overlain in part by later quarry waste. The entrance to the Horse Crag Level remains visible and the tunnel has recently been cleared by the Cumbria Amenity Trust Mining History Society (CATMHS), although it is unsafe to access without appropriate equipment and supervision. To the north of the site are the expansive remains of Penny Rigg (Horse Crag) quarry, worked commercially since the mid-18th century. The aim of the community survey was twofold. 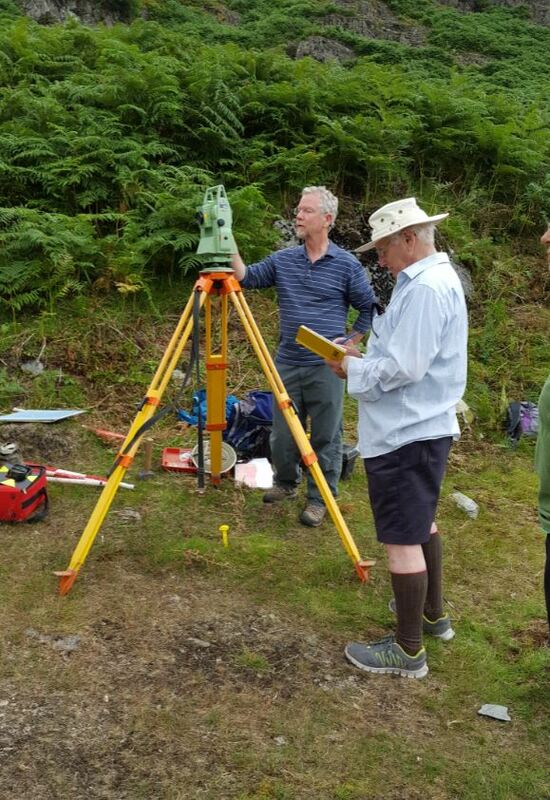 Firstly, to engage local volunteers in the history and conservation of the site through providing practical, hands-on training, and secondly, to prepare a detailed analytical survey (Historic England Level 2/3) of the surface earthworks and structures. 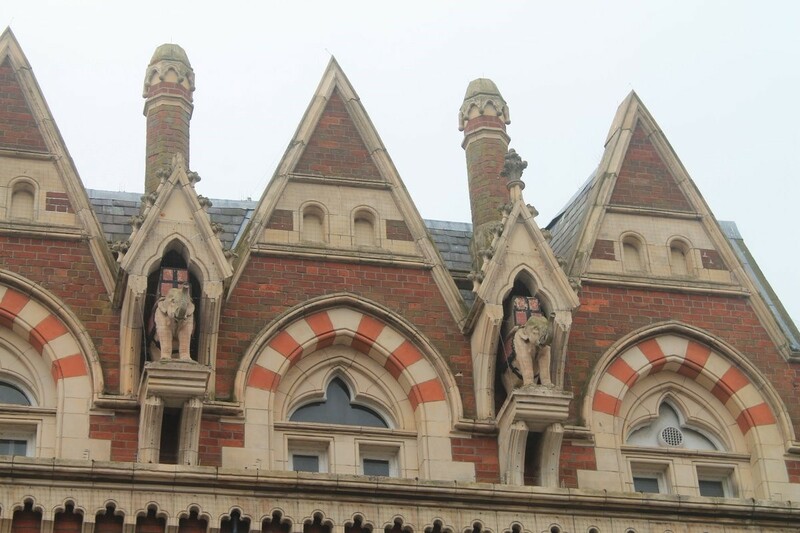 The latter was required to inform a subsequent phase of building conservation. A comprehensive record of the complex was made comprising a topographic, earthwork and building survey. 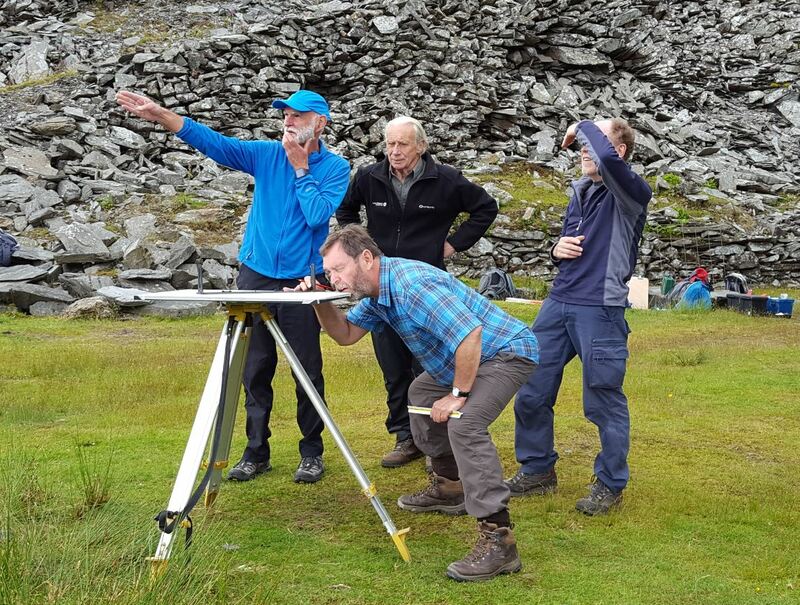 The focus was on ensuring the volunteers received a firm grounding in traditional survey skills – plane table, tape and offset – which could be easily transferred to other mining sites in the area. The use of aerial drones, Global Positioning Systems (GPS), reflectorless total station theodolites (REDM), and rectified photography were also demonstrated. 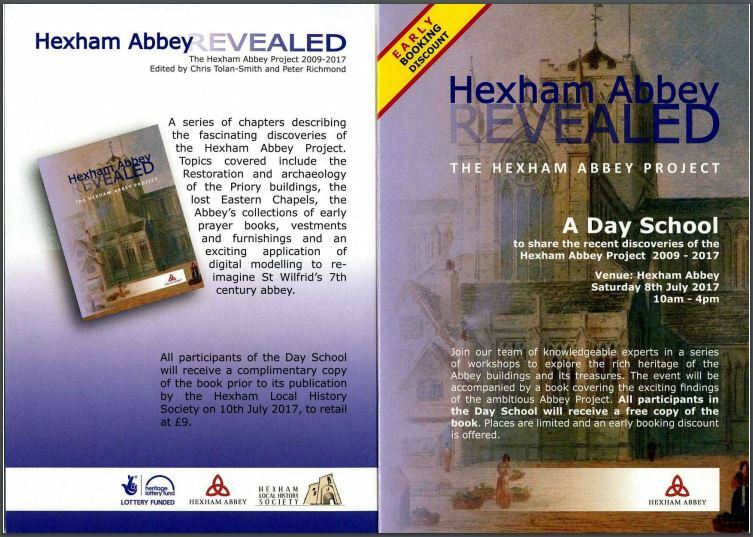 A full copy of the report can be downloaded for free from the NAA website, or contact Penny Middleton at pm@naaheritage.com. 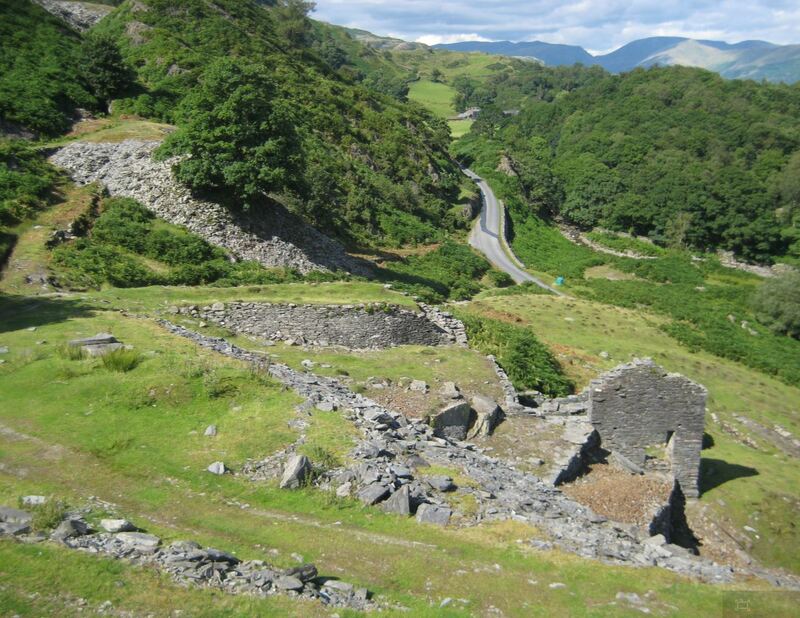 If you interested in taking part in the Coniston Copper Project then please contact Eleanor Kingston at Eleanor.Kingston@lakedistrict.gov.uk or check the project website at http://www.lakedistrict.gov.uk/learning/archaeologyhistory/coniston-copper for details. Further survey work is planned for March at the site of Low Mill Bonsor for three weeks. NAA would like to thank all the volunteers who took part for their enthusiasm and dedication throughout the three-week project. 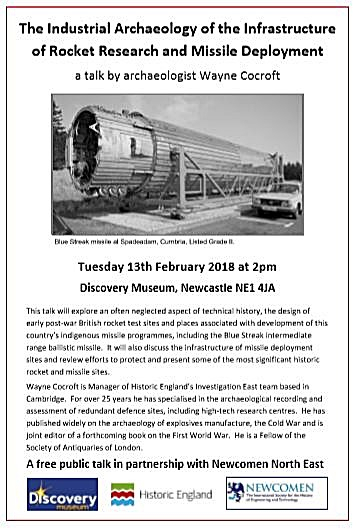 We are also indebted to CBA North and the Archaeological and Architectural Society of Durham and Northumberland for the loan of the plane table, and to Warren Allison and his colleagues at CATMHS for their knowledge, advice and support”. 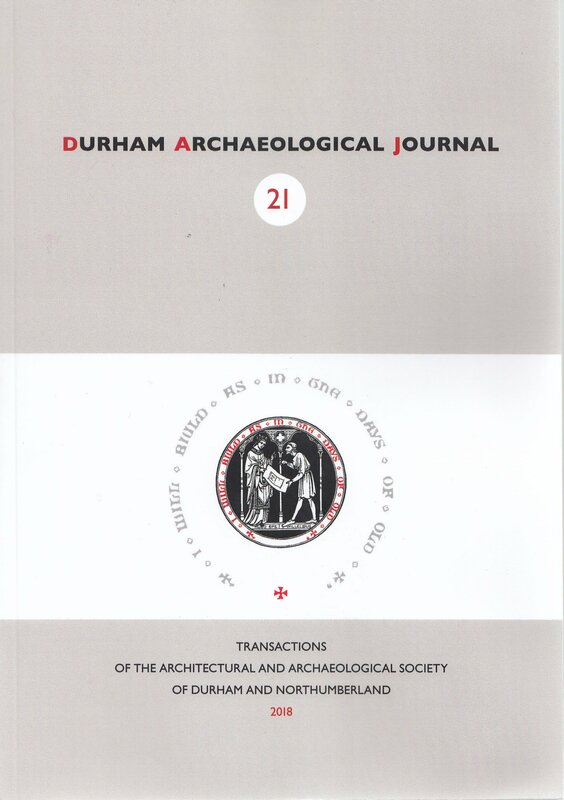 “The Society, apart from its re-enactment group, confines itself at present to arranging the annual conference and its publications, including the Arbeia Journal, but a range of new activities are being planned”. [As the second announcement for the weekend coming, here is the poster for the next lecture of our group member the ‘Arch & Arch’. This lecture covers these axes which have been found across Britain and Europe, but will also note their comparative rarity and the science that allows the axes to be traced to source, Ed.]. Contact details for each of these local societies and groups can be found through our own website pages if you have any questions regarding their times and venues. 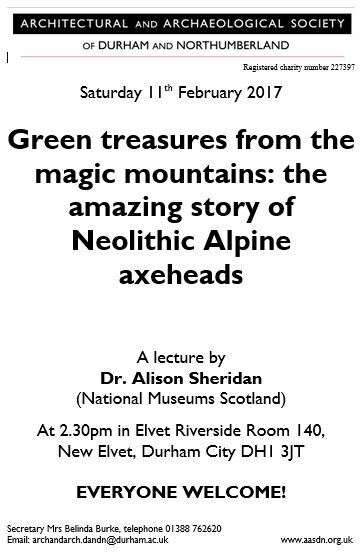 This entry was posted in E Newsletter and tagged AASDN, Cumbria, display, Finds, Lake District National Park, lecture, Northumberland, Post-Medieval, survey, TillVAS on February 6, 2017 by cbanorth. Our latest issue once again spans the variety of the CBA North region – this is not quite the last email of 2016 to you, as a further one is to come yet. Today’s issue has some last minute news of some training tomorrow and two further round-ups from local groups. (There is no system in play here – we move from the A of Appleby’s in the last issue to B’s this time with Bernicia and Border). 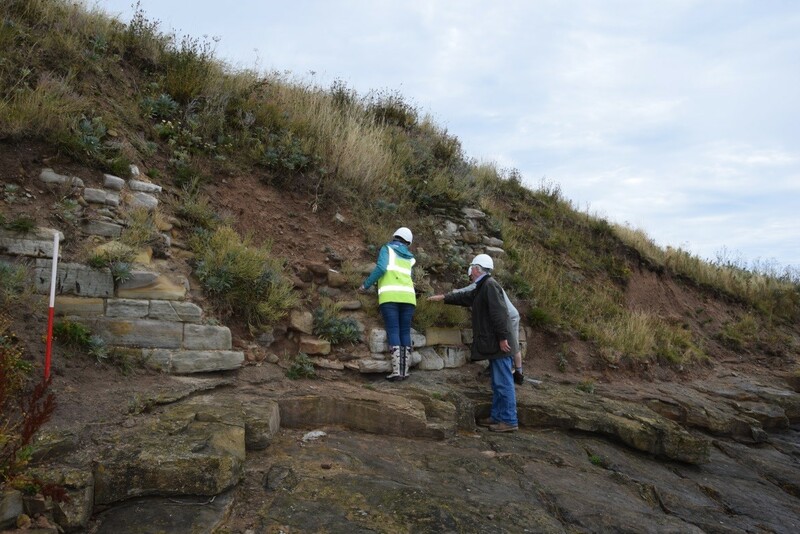 Again we span the geographical expanse of our region from Morecambe Bay in our southwest to the northeast in Northumberland for the varied field-based and recording work by the Bernician Studies Group, as well hearing what Berwick-based lectures the Border Archaeological Group have been enjoying during 2016 and what their members can look forward to 2017. 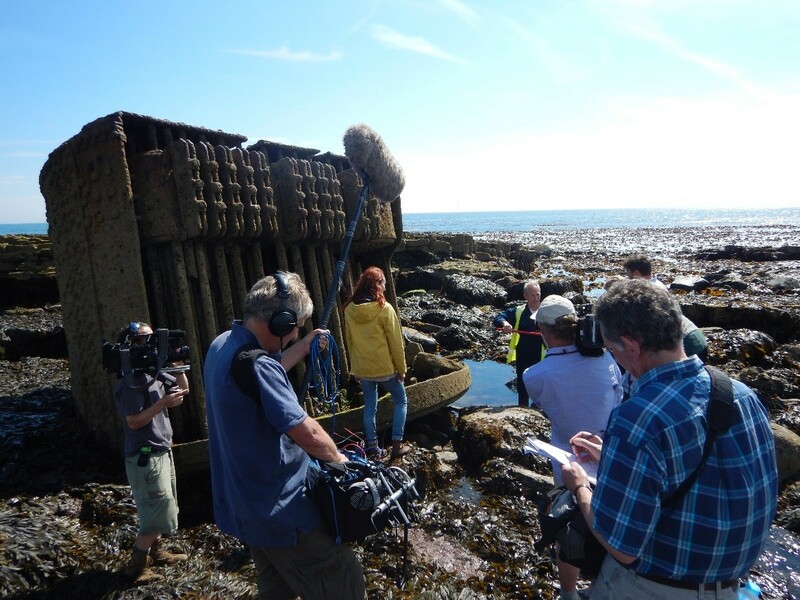 As part of the Headlands to Headspace Landscape Partnership Scheme, currently being delivered by Morecambe Bay Partnership, we have arranged some further free training in documentary research for volunteers. The workshops have been organised for Kendal (20th December, 10th and 17th January), Arnside (7th and 14th January) and Barrow (28th January and 4th February). 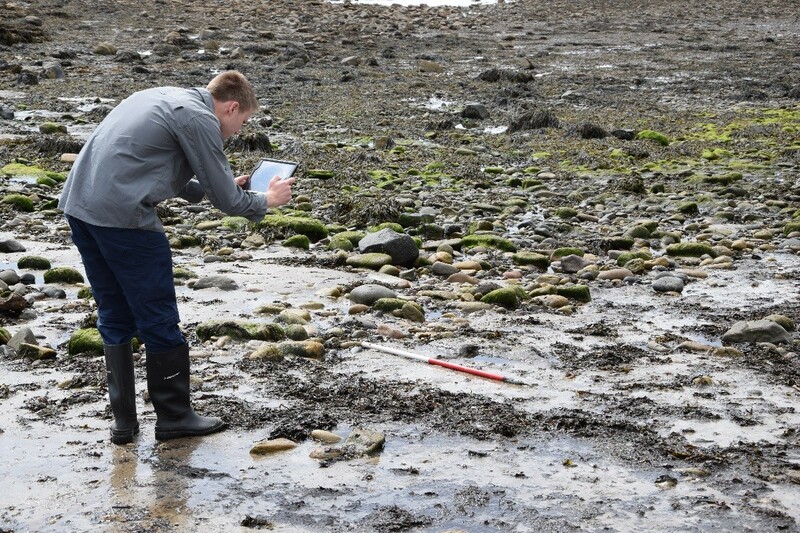 The training is hosted by Dr Richard Newman of Wardell Armstrong Archaeology (formerly the Cumbria County Archaeologist), is Bay themed and will introduce research techniques for desk-based archaeological study. We hope to get volunteers to contribute to desk-based reports focused on specific themes/topics as part of the training. …but not for a picnic, you may learn about a possible ancient Northumbrian woodland boundary zone. 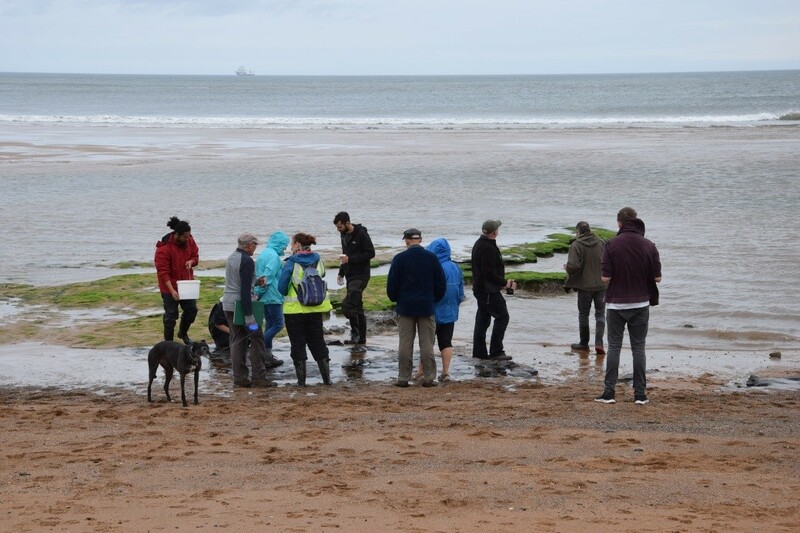 Members of the Bernician Studies Group are looking at an area between Wansbeck and Coquet in Northumberland. 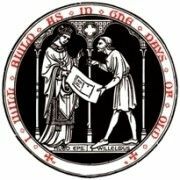 We call the study Cocwudu, a name recorded in the History of Saint Cuthbert at the end of the 11th century. The word seems to be a re-formation of the river-name Coquet and Old English wudu, meaning woodland. Place name elements such as Old English hryst, leah, sceaga and wudu, as in Coquetdale at Morrelhirst, Horsley, Lordenshaw and Witton, provide clues of a long-gone forested area. During the last two years, members have checked many likely locations for plants which indicate ancient semi-natural woodland. We are noting the common ones such as Wood Anemone and Dog’s Mercury, and rarer ones such as Herb Paris and Toothwort. Most of these woodlands only survive in outlying places, along steep and inaccessible sides of streams and rivers. 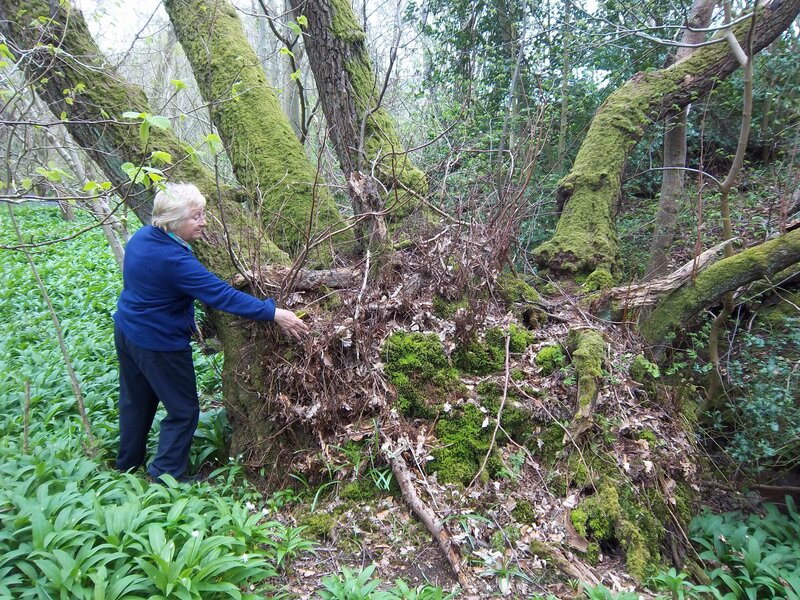 We look for evidence of woodland management in the past, such as pollarding and coppicing. 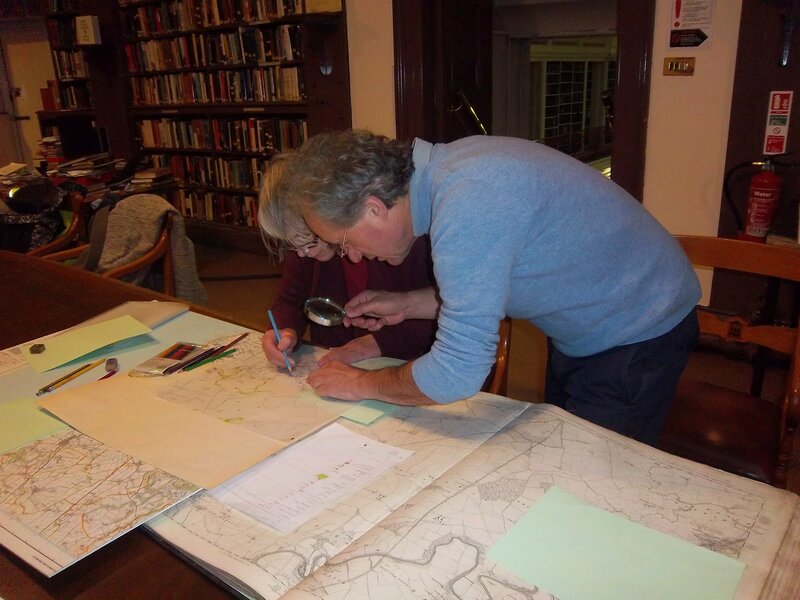 We are also studying historic township boundaries using the 1860s Ordnance Survey maps at the Literary and Philosophical Society library in Newcastle. We are also looking at the Brinkburn and Newminster Cartularies for evidence of Medieval arable and animal management, forests and hunting. Some members have been translating selected charters from Latin into English. Experts associated with Newcastle and Durham universities are guiding the work. The Bernician Studies Group is closely associated with Explore, the Newcastle-based independent lifelong learning programme. Explore offers an exciting range of classes and lectures in philosophy, art, history and archaeology, literature, science and more, which are open to all. Their spring programme starts on 16th January 2017. More information on the group can be found at www.bernicianstudies.eu. BAS have enjoyed an excellent programme of lectures during 2016. 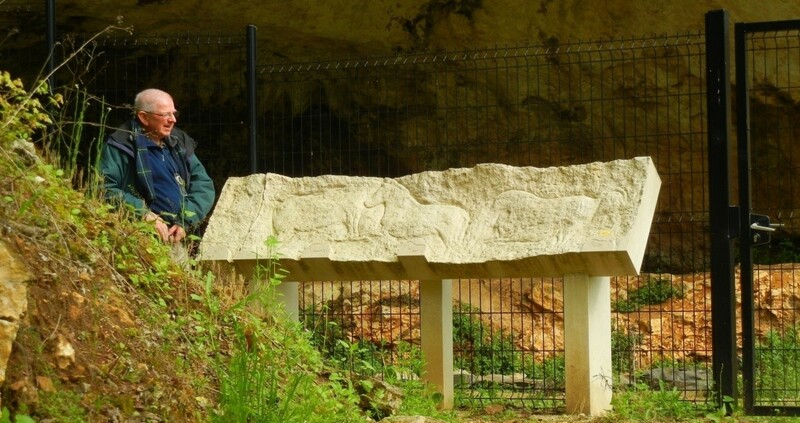 Beginning with Joanna Hambly, we learned about 150 years of documentation of the Pictish carvings at Weymss Caves before Chris Fowler of Newcastle University described Early Bronze Age Burial Practices in North East England and South East Scotland. We then had a tour of the Sahara with Tertia Barnett who spoke of the rock carvings to be found there. She was followed by Jeremy Paterson who described the Roman economy. Our last speaker before the summer break was Dr Jane Webster, founder of a Young Archaeologists Club in Newcastle speaking about the University’s work with young people. This was especially pertinent now that A-level Archaeology is to be a thing of the past*. In September, Myra Giesen spoke about Mortuary Archaeology. She was followed by Elidh Ferguson of the Face Lab at Liverpool Sir John Moores University, stepping in admirably for Professor Caroline Wilkinson, who held the audience enthralled as she described how facial images are reconstructed from the skull*. 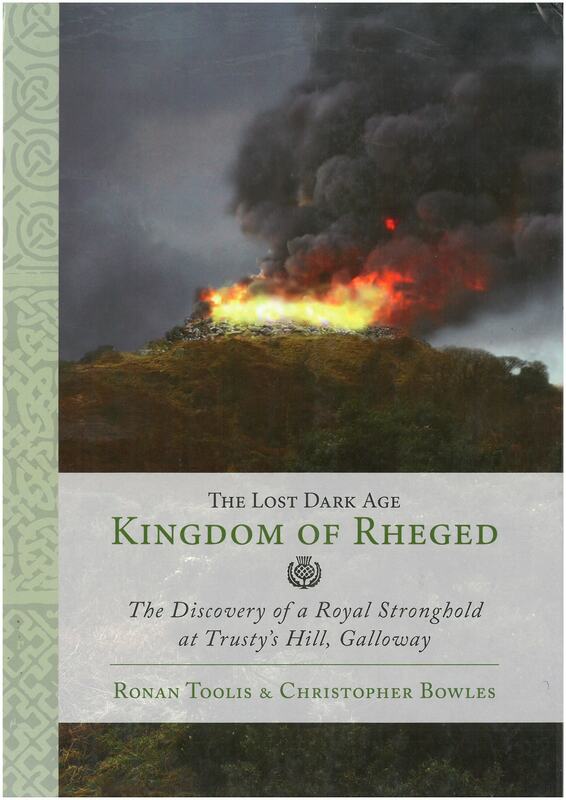 Colleen Batey spoke with great knowledge and enthusiasm about Pagan Viking Burial in November. 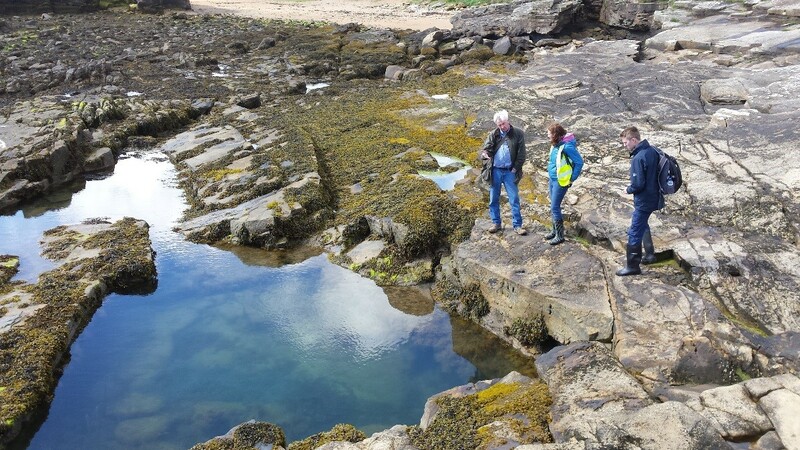 Professor Clive Bonsall wound up this year’s lecture series with a talk on his work on Mesolithic shell middens on the east coast of Scotland in the “Obanian Problem”. In 2017, we welcome Fraser Hunter and Andrew Birley talking about the Celts and Vindolanda respectively. They are followed by Tatiana Ivleva talking about Iron Age and Roman period glass bangles. 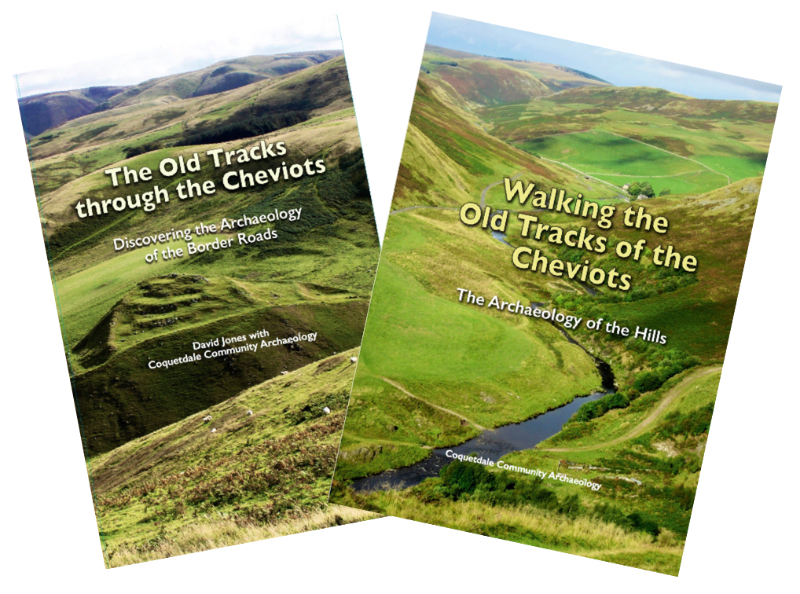 The following three talks are on local topics: Paul Gething on Bradford Kaims, Jenny Proctor on Needle’s Eye and Ian Kille on how the local geology has shaped its history. 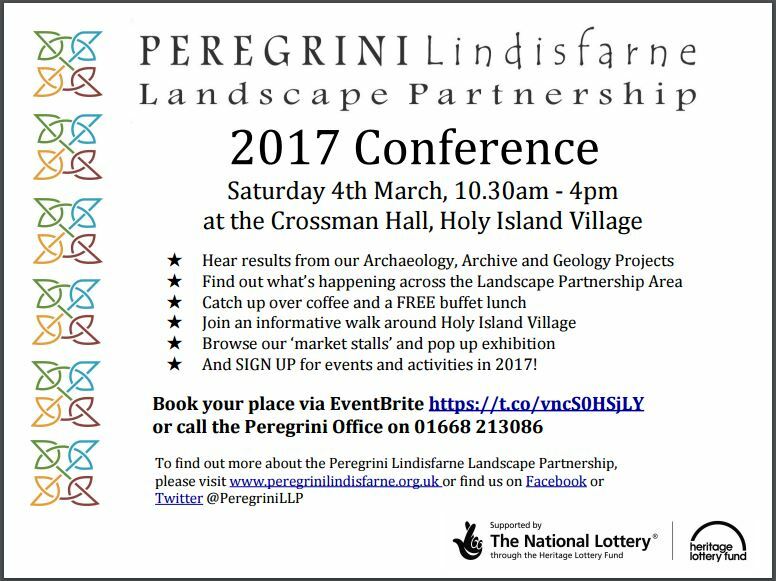 Andrea Dolfini will speak on reconstructed Bronze Age fighting styles followed by Richard Carlton on recent discoveries on Lindisfarne. Our President, Lindsay Allason-Jones somewhat enigmatically, will wind up the programme by asking whether Hadrian’s Wall is archaeological site or an artistic muse. 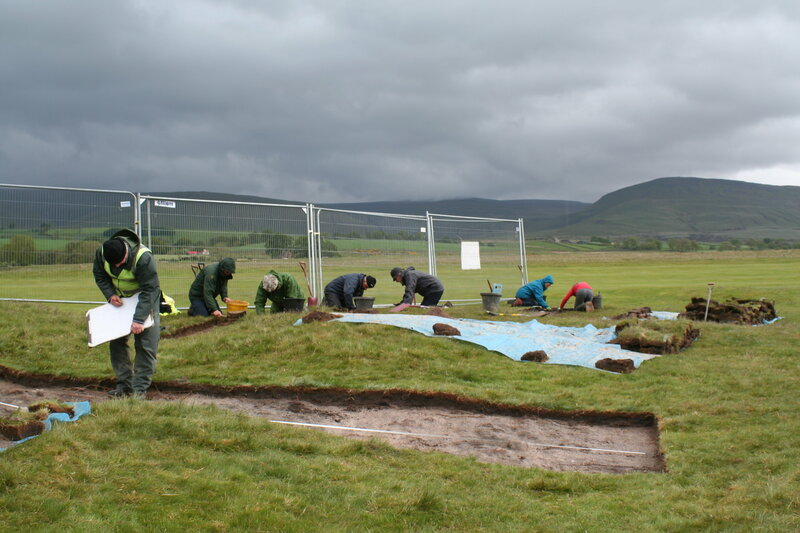 This entry was posted in E Newsletter and tagged BAS, CBA North, Cumbria, Early Medieval, heritage skills training, Landscape, lecture, Medieval, Northumberland, Northumbria, Training on December 19, 2016 by cbanorth.